Šibenik's Town Hall boasts with history, culture and beauty that make every event a grandiose affair. Šibenik’s Town Hall, in the medieval times the most prominent building of the City of Šibenik, is today known as one of its most honorable cultural monuments. It is considered to be one of the most beautiful Croatian town halls in general. Building, erected in the first half of the 16th Century, boasts a remarkable harmony of the High Renaissance style. Its ground-floor encompasses the cloister (with columns supporting semi-circular arches) from which there was an access to the offices of communal administration in the first floor. On the left side of the building, an adjecent bell tower used to call town’s noblemen to gather for a session. In 1943, the Town Hall was completely ruined during the air attack. It was restored in its original form after the war, while it was organized and equipped in its interior according to the needs of its new function. 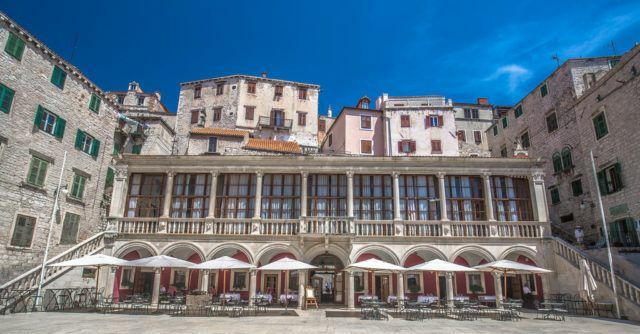 The Town Hall is located in the medieval central town square (the Square of the Republic of Croatia). Šibenik’s central square – connecting the Town Hall and the Cathedral of St.James (known for being a part of the UNESCO World Heritage List on one hand, and for its majestic presence in the Game of Thrones on the other) – is the Šibenik’s main landmark, often used for different events. In fact, exactly this outdoor space that in the same picture frame catches the Cathedral and the Town Hall, is one of the most beautiful details of Šibenik. A short stroll from the Town Hall and the congress attendee can either reach the sea or gets absorbed into the cobblestone streets of the Šibenik’s Old Town. No matter what direction one takes from the Town Hall, in just a few steps one gets immersed in Šibenik’s medieval beauty accompanied by sparkling beams of sea reflections. Town Hall’s first floor still to these days offers a hall that can be used for meetings, conferences, and other events, while the ground-floor has been renovated for the restaurant purposes. The first floor hall offers a capacity for 70 sitting and 100 standing guests. The space can be adjusted according to the purpose. When organizing an event, the Town Hall takes care of a screen, microphone, projector, AC, and wi-fi. Catering services are arranged with the ground-floor restaurant. Participant at your event certainly should visit the Cathedral of St.James standing just opposite of the Town Hall. Your choice will engulf the congress guests with Cathedral’s historical and cultural grandeur on one side, and with its »Hollywood« role as the magnificent Iron Bank in the City of Braavos in Game of Thrones.